London, early May 1940: Britain is under threat of invasion and Neville Chamberlain’s government is about to fall. 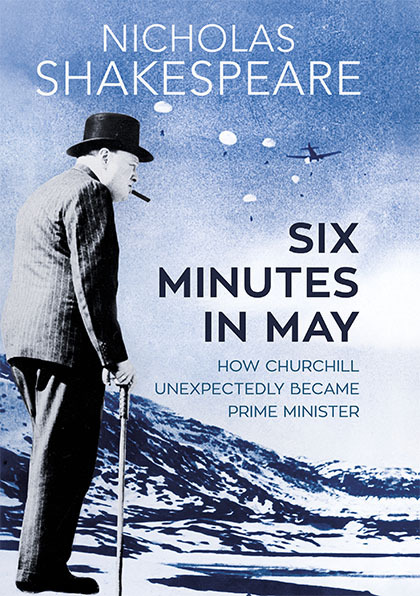 It is hard for us to imagine the Second World War without Winston Churchill taking over at the helm, but in SIX MINUTES IN MAY Nicholas Shakespeare shows how easily events could have gone in a different direction. Britain’s first land battle of the war was fought in the far north, in Norway. It went disastrously for the Allies and many blamed Churchill. Yet weeks later he would rise to the most powerful post in the country, overtaking Chamberlain and the favourite to succeed him, Lord Halifax. It took just six minutes for MPs to cast the votes that brought down Chamberlain. Shakespeare shows us both the dramatic action on the battlefield in Norway and the machinations and personal relationships in Westminster that led up to this crucial point. Uncovering fascinating new research and delving deep into the backgrounds of the key players, he has given us a new perspective on this critical moment in our history. those writers who can do anything." Superb: far and away the best account of the moment which changed our national life and the world, and filled with extraordinary new details. Nicholas Shakespeare, as one might expect, brings a novelist’s eye to the characters he writes about, but it is the extraordinary way he marshals his material, far more extensive than I’ve come across before, which makes this book quite simply magnificent. The historical record requires constant refinement , but here is disruption, brilliantly rendered by an accomplished novelist. The failures and bungling that preceded Churchill’s accession to formidable war leader, the necessary re-evaluation of Chamberlain (the Battle of Britain might have been lost without him) are braided into a compelling narrative history. Shakespeare brings both meticulous research and fictional artistry to illuminate the machinery of government under extreme stress and the abrasive conflict of large, self-confident personalities. It’s a superb achievement. Nicholas Shakespeare’s impeccably researched, coherent and revelatory explanation about how Churchill became prime minister at the exact time of Hitler’s onslaught in the west is totally captivating. It will stand as the best account of those extraordinary few days for very many years. Utterly wonderful… it reads like a thriller.